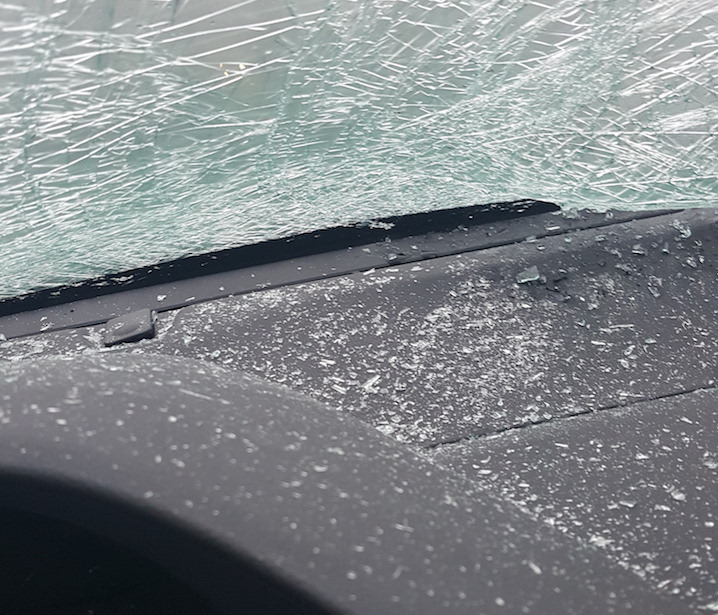 Whalley resident Cole Edward's car was hit with falling ice from the Alex Fraser Bridge on Monday morning. Intense snowfall might see a temporary closure of the Alex Fraser Bridge, Ministry of Transport officials said. Snow is expected to begin falling again on Thursday night, according to Environement Canada Low lying areas can expect between five and 15 centimetres of snow by Friday night and higher elevation areas can expect up to 25 centimetres. De-icing agent has been applied to the Alex Fraser bridge and will be reapplied throughout the day, ministry officials said. The cable collars on the Port Mann are also ready to go. This comes after a Monday snowfall caused ice and snow bombs to fall from the Alex Fraser and Port Mann bridges on Monday. The snow from the Port Mann and Alex Fraser Bridge damaged 40 cars, according to ICBC claim data – including that of 22-year-old Cole Edwards. With the roads still clear and the sun shining on Monday morning, Edwards was hoping to beat the storm during a northbound drive across the Alex Fraser Bridge on Monday morning. The Whalley residents hopes, like those of 29 other people going over the Alex Fraser that day, were dashed in front of his eyes as an ice bomb fell off the bridge and through the windshield of his Honda Civic. “I thought I had a chance,” said Edwards said. Edwards isn’t quite sure if the ice fell off the towers or the cables. “It was right around the second tower as I was headed northbound. I think it came from the tower but it might have come from the cables,” he said. “It even pierced through the windshield and damaged the dashboard of the vehicle,” said Edwards. Edward’s car is at a shop now getting a new windshield. Later, he’ll look into getting his dashboard replaced or repaired. The province has said it would cover the deductibles for any vehicles damaged on the Alex Fraser and Port Mann bridges during the storm earlier this week. While Transportation Minister Todd Stone wouldn’t confirm the cost to the province, ICBC said that the average deductible was $300. Public-transit wise, Translink said that it is preparing for the weather by applying de-icing agent to train lines, scheduling extra staff and even switching up bus routes if needed. Environment Canada is asking people to report severe weather by e-mailing ec.tempetepacifique-pacificstorm.ec@canada.ca or tweeting reports to #BCStorm.